At Cumin in Hyde Park, Executive Chef Owen Maass is churning out some of Cincinnati’s most impressive, eclectic food. Behind the scenes, he’s driven. Articulate. Funny. Exactly who he says he is – no matter what. Lucky for us, Cumin owner Alex Mchaikhi is opening a sibling restaurant next door (called M), and Owen will be Executive chef there too, featuring a rustic, wood-fired menu. 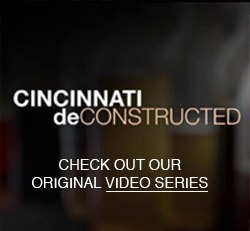 See his story in our third episode of Cincinnati Deconstructed, filmed by Michael Holder and produced by yours truly. An intimate, behind-the-scenes peek inside the unique personalities that define the food scene here in Cincinnati. We’ve got big plans for the future. Please continue your enthusiasm by sharing, tweeting, posting and commenting so that we can continue this project. And let us know if you catch the video playing on the jumbotron in Cincinnati’s Fountain Square. See our pilot episode with rockstar mixologist Molly Wellmann and our second episode with Jean-Francois Flechet from Taste of Belgium. Let us know in the comments. Learn more about his new restaurant here – and of course – if you’ve got ideas for a future episode, please share. We’re always listening. Special thanks to Owen Maass, Alex Mchaikhi, Katerina Pototsky Minevich and the staff at Cumin for making this video possible. What’s not to love? Thanks for sharing. THIS is exactly the kind of guy I want cooking my food! His excitement, passion and sincerity is contagious! Love Cumin- can’t wait for M! He’s exactly the kind of guy I want cooking my food, too, Beth. Another great video, my friend! Love seeing you and Michael Holder shining your creative spotlight on talented chefs who make this such an exciting time for food in Cincy! Loved the video – you captured his passion and whimsy perfectly. Glad you’re back. Another great video! It is really important for the people and food lovers in this city to learn a little more about the passionate, hard working chefs who are showcasing their art to us everyday. Keep the videos coming! Thanks for sharing!